I finished this book at least a month ago, but have been putting off writing a review. To review it seems almost condescending – like rating Beethoven’s fifth symphony or deciding how many stars you’d give Michelangelo’s “David”. This book is a masterpiece. Which is exactly what I’d heard, actually. I’d been told on numerous occasions that I must read it, that it would be an unforgivable crime for a speculative fiction writer to have not read Mervyn Peake’s Gormenghast series. It took me a while, I have to admit, before I brought myself around to actually sitting down and concentrating on what I could see (by casually flicking through the pages) would be some pretty dense pre-1950s literature. It seemed like it would be a bit of a slog, though why I thought that then I now don’t know. Because once I started reading I was thoroughly hooked. 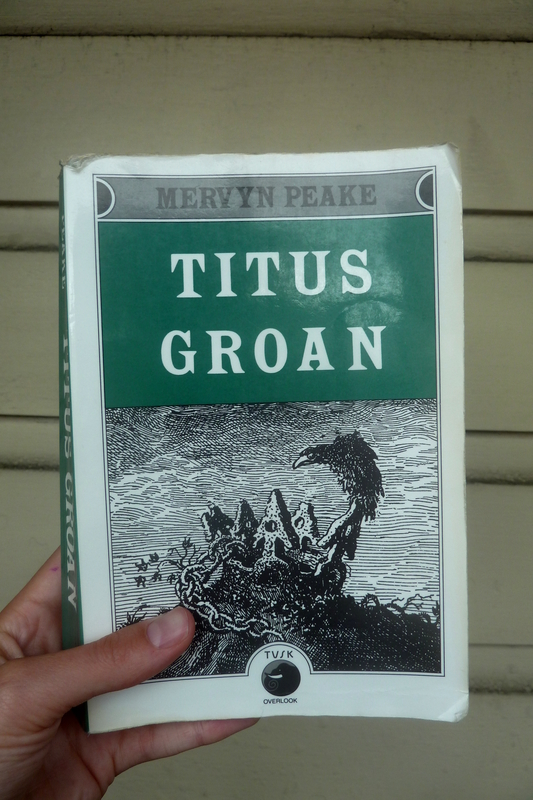 Titus Groan is set in Gormenghast: a crumbling fortress of ancient stone, with precarious towers, gardens, and clusters of patchwork buildings built between and among its decaying walls. It is also the seat of the family Groan. Seemingly oblivious to the world outside their small sphere of everyday events, the lives of the people who live within the Keep (and even those “mud dwellers” who live huddled against its outer walls) are dictated by rules and rituals put down as lore too long ago to remember. Everything must remain the same (no matter the consequence). The rituals must be adhered to (no matter how ridiculous and irrelevant). Change is sacrilegious. The story covers the first few years of Titus Groan’s life, the new heir to the Earldom. I am certain he’ll play a more central role in the two following books, but as he’s just a baby, it’s those around him that we get to know well – his parents, his older sister, his nanny and aunts, and the few key servants who are close to the ruling family. * Each character is as downright mad as the next, from Mr Flay, the Earl’s tall and angular personal servant whose joints are so dry that he crackles each time he takes a step, to Ladies Cora and Clarice, identical twins whose facial muscles, so under-used, are unable to muster a single expression. As you meet each one they begin by seeming simply ludicrous, but by the end of the book you feel you know and understand each intimately. Central to the overarching plot is Steerpike’s story, and we watch him ascend (through intelligent manipulation) from lowly kitchen boy to an esteemed servant; so too is the feud between loyal Mr Flay and Swelter, the wildly obese and sadistic chef. *As an aside: about halfway through the book I stopped and counted the characters and was happily surprised to realise there was an equal number of men and women. A bird swept down across the water, brushing it with her breast feathers and leaving a trail as of glow-worms across the still lake. A spilth of water fell from the bird as it climbed through the hot air to clear the lakeside trees, and a drop of lake water clung for a moment to the leaf of an ilex. And as it clung its body was titanic. It burgeoned the vast summer. Leaves, lake and sky reflected. The hanger was stretched across it and the heat swayed in the pendant. Each bough, each leaf – and as the blue quills ran, the motion of minutiae shivered, hanging. Plumply it slid and gathered, and as it lengthened, the distorted reflection of high crumbling acres of masonry beyond them, pocked with nameless windows, and of the ivy that lay across the face of that southern wing like a black hand, trembled in the long pearl as it began to lose its grip of the edge of the ilex leaf. Yet even as it fell the leaves of the far ivy lay fluttering in the belly of the tear, and, microscopic, from a thorn-prick window a face gazed out into the summer. Swelter’s eyes meet those of his enemy, and never was there held between four globes of gristle so sinister a hell of hatred. Had the flesh, the fibres, and the bones of the chef and those of Mr Flay been conjured away and down that dark corridor leaving only their four eyes suspended in mid-air outside the Earl’s door, then, surely, they must have reddened to the hue of Mars, reddened and smouldered, and at last broken into flame, so intense was their hatred – broken into flame and circled about one another in ever-narrowing gyres and in swifter and yet swifter flight until, merged into one sizzling globe of ire they must have surely fled, the four in one, leaving a trail of blood behind them in the cold grey air of the corridor, until, screaming as they fly beneath innumerable arches and down the endless passageways of Gormenghast, they found their eyeless bodies once again, and re-entrenched themselves in startled sockets. Really I feel I can’t add anything further. If you like fantasy (there’s not much magical about the world, but it is a different world), then I’d recommend reading this. If you like good literature, then I insist that you really must read this. And if you like neither of these things, well… then don’t. See if I care. 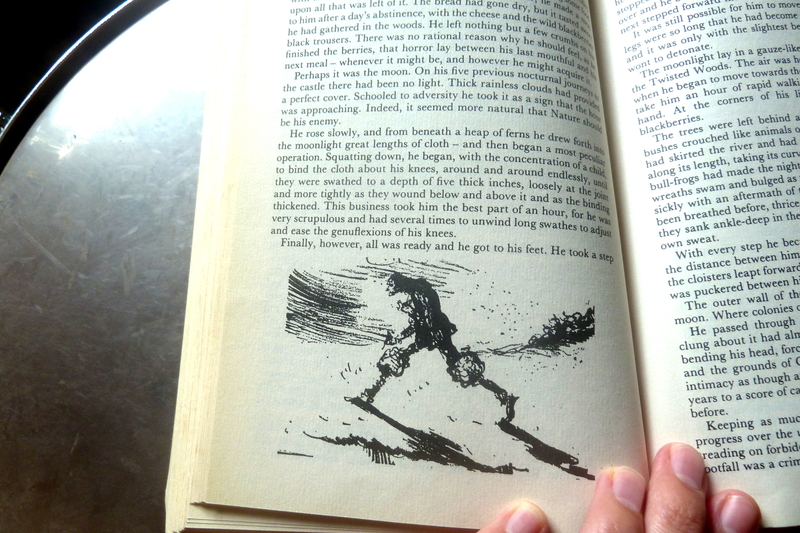 Interestingly, Peake is not just known for his writing, but for his illustrations too (he’s Alice in Wonderland, and Samuel Taylor Coleridge’s The Rime of the Ancient Mariner, amongst other things). 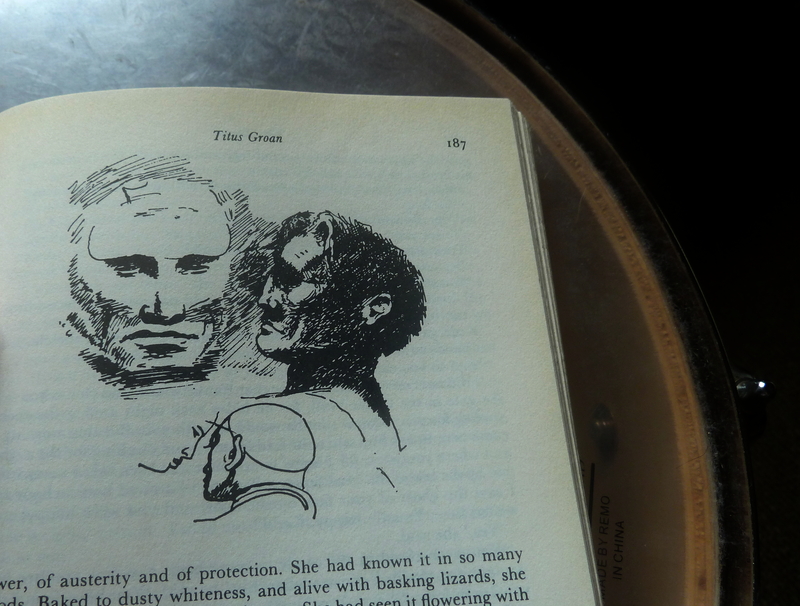 The version of Titus Groan I own is speckled throughout with the odd sketch, adding to its overall charm. Clearly it’s time for me to re-read that amazing series. 🙂 Thanks for reminding me, I. K. Paterson! Great review.